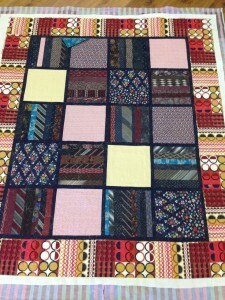 Last Fall I wrote a post about making quilts using men’s neckties. 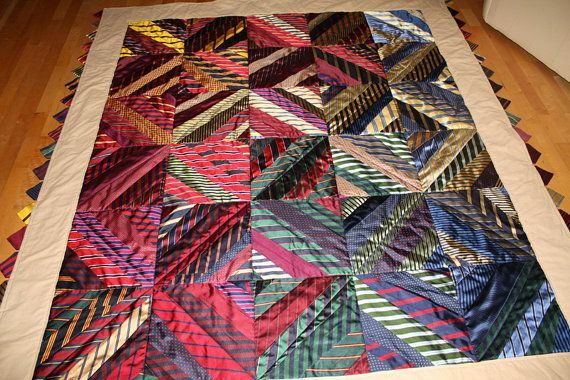 The subject had a lot of interest, so obviously there are a number of quilters who are interested in ways to use discarded neckties. Indeed, neckties are made of expensive, beautiful fabrics. 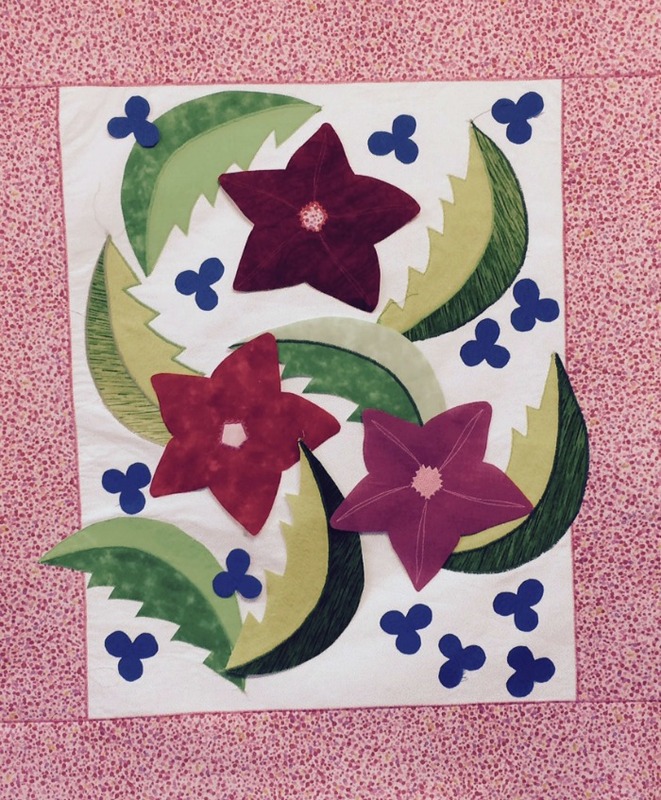 I posted a link to a paper-pieced pattern for this 12-inch block called “Starched Shirt.” That link had an issue, so I am now posting a replacement link for simple templates for this block. You can find the pattern here: Starched Shirt PDF. Note the long pieces of the shirt front span onto a second page, so you will need to tape the pages together and cut out this template. There are three inset seams in the block. Don’t panic, they aren’t too difficult. Sew the sides of the shirt to each side of the tie. Then sew the neck piece to the tie section (seam 1), starting and stopping 1/4 inch from each end of the seam. Turn the left side of the neck piece and fit it to the upper left shirt collar and stitch (seam 2) from the tie to the top of the collar , and repeat for the other side (seam 3). Then do the same for each background pieces. Sew the small seam at the collar, starting and stopping 1/4 inch from each end of the seam (seam 4). Then turn the background to fit along the neck, and sew from the top of the collar to the top of the block (seam 5), and repeat for the section along the shoulder (seam 6). Be patient, and gently ease the fabric pieces into place. Leaving the 1/4 spaces at the ends of the short seams is important, as it allows you space to start your next seam. 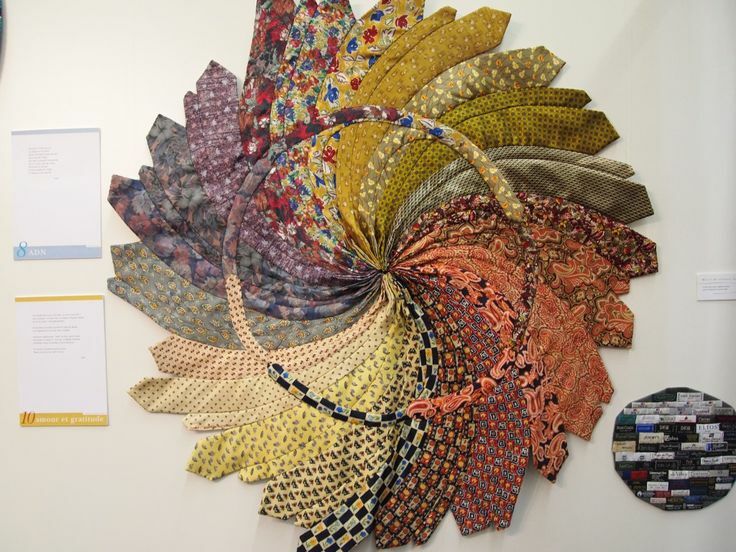 While we are revisiting the subject, I thought I would share a few more photos of these creative projects using men’s neckties. 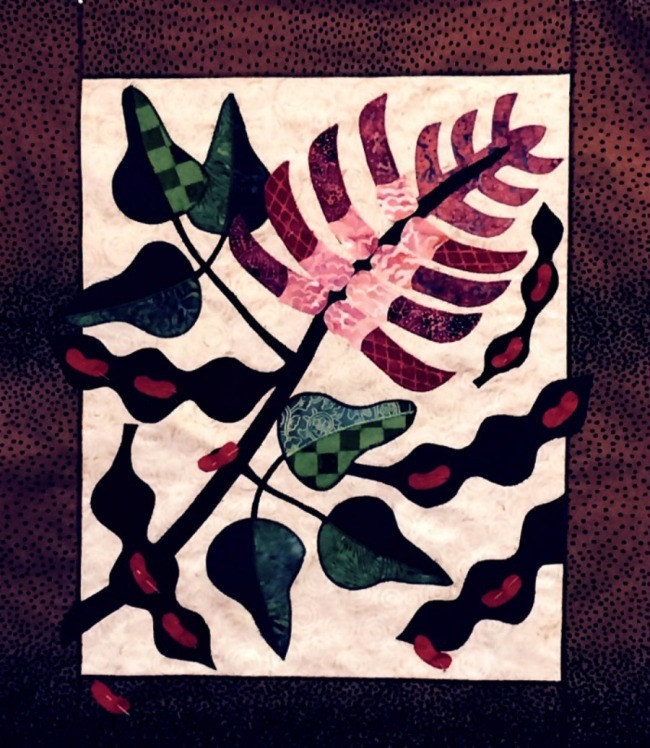 This quilt was made by Nancy Sturgeon. I love that she has not only incorporated shirting fabric into the design, but she has also used the label sewn to the back of the tie in her border design. 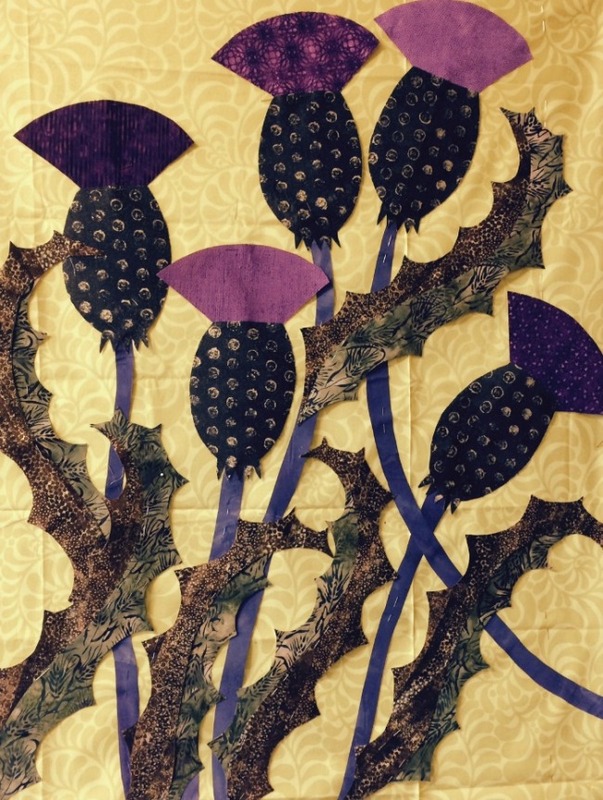 Virginia Anderson has given these silk ties new life by using them in this beautiful Crown of Thorns block. 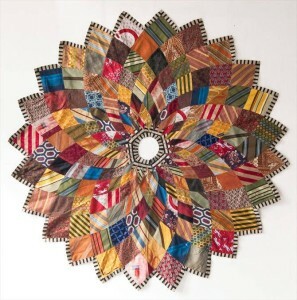 This is an amazing use of color and she has done a great job of mixing a variety of fabric designs. 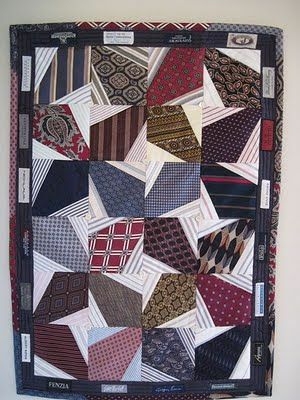 This lovely quilt was a custom design done by Linda Gutherie McClelland. 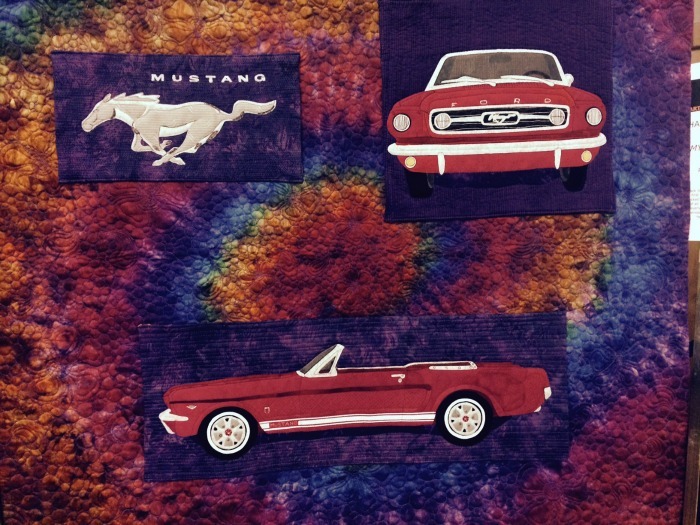 For those of you who have ties and need some help getting them into a quilt, you can find Linda on Etsy. 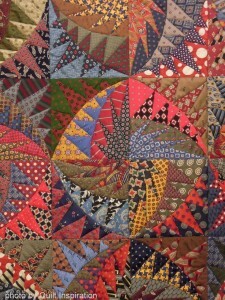 I cannot provide the name of the maker of this quilt. If someone can provide the maker’s name, leave a comment and I will update this image. I love the use of the dark grey solid fabric between the tie fabrics in this quilt. It allows the use of a variety of fabric designs and colors, without it looking mismatched. 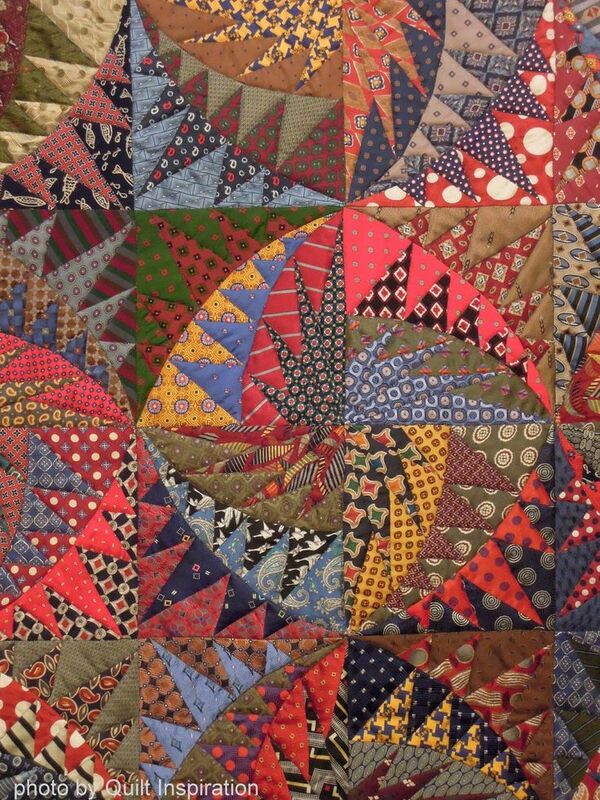 I don’t have a maker’s name for this quilt, either. The ties are sewn together and cut into blocks, then separated by solid black strips which helps unify the design. The solid blocks also provide a place for the eye to stop and rest. 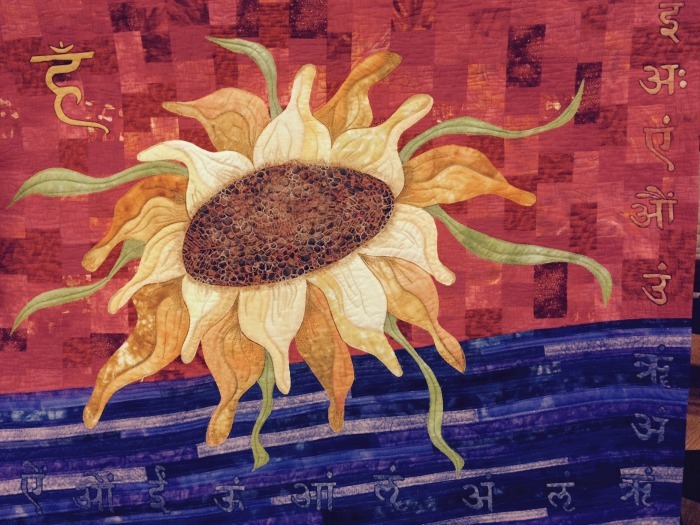 This art quilt was exhibited at Quilt Expo Beaujolais in 2013. 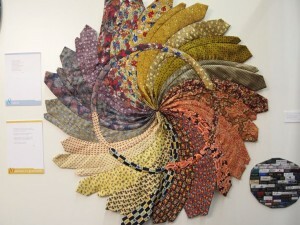 I love the movement created by the soft curve in the ties when they were sewn together. 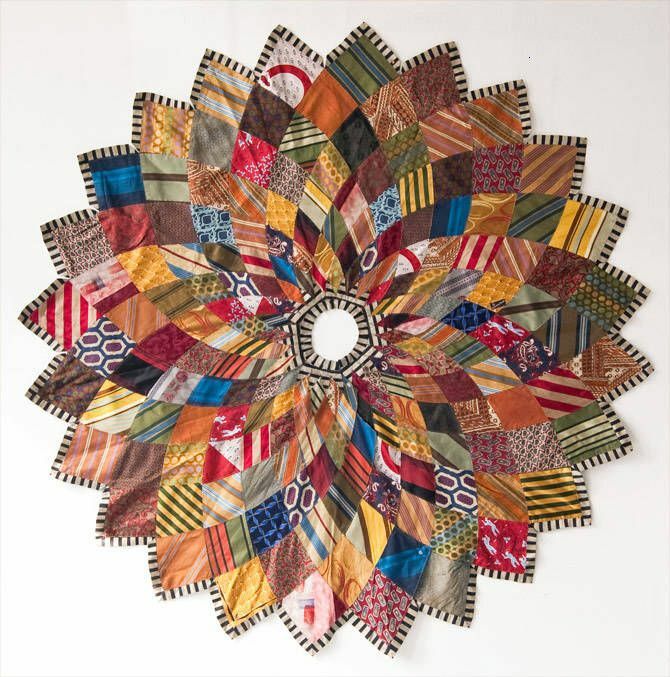 The circle of appliqued ties on the surface helps reinforce the circular movement. I could hang this Christmas Tree skirt on the wall and look at it all day long! This custom tree skirt is made by Chicago Lost and Found. Each skirt uses over 250 neckties. Beautiful! 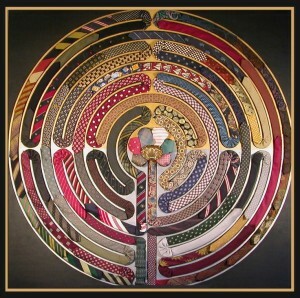 This last piece of necktie inspiration comes from the website of Italian architecture firm Oreste Ruggiero. 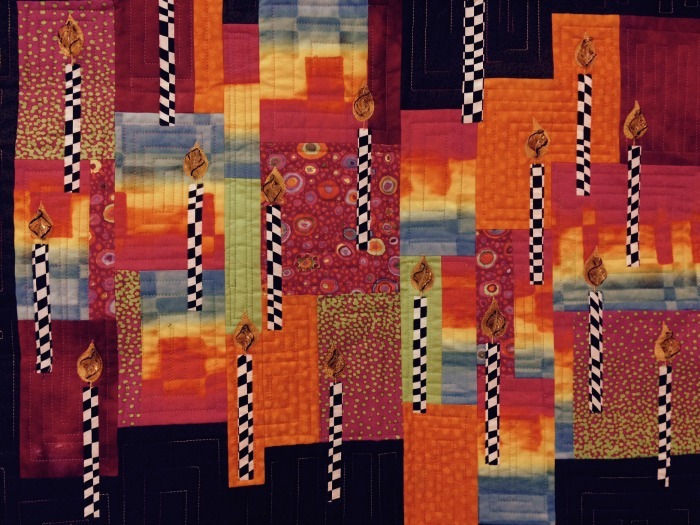 They do not identify the maker of this beautiful labyrinth style quilt, but it is a stunner. It appears to be an applique piece, and has such a calm, meditative quality to the design. Bellisimo. 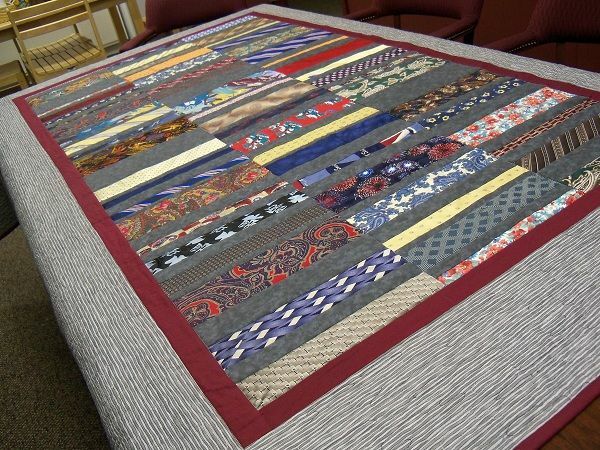 Hopefully, these beautiful and inspiring quilts make you want to grab an armload of ties and a pair of scissors! So many options…. This is one of my favorite little birds. 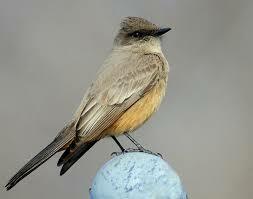 It is a Western Phoebe. I volunteer once a week in a local public garden, and last week one of these sweet little birds followed me around the garden, watching me rake up leaves and watching for the worms I accidentally uncovered. (Sorry, worms!) Phoebes seem to prefer sitting on the tip of things like sprinkler heads, or a fence post. The ruffled feathers on their heads make them look like they just got up and forgot to comb their hair! They have a sweet song and lovely colors. So why am I waxing poetic about birds? This month’s Quilting Arts magazine introduced their new Reader Challenge called “Birds of a Feather.” They ask for a 9″ x 9″ quilt based on a bird theme. It may be made of any materials, must be quilted, consist of three layers and be bound or closed along the edges. They request two low resolution images be emailed to them by April 3rd to challenges@interweave.com. Finalists will be posted on their blog at quiltingdaily.com on April 8th. So, if you have a favorite bird, why not take the challenge and make one of these tiny quilts? 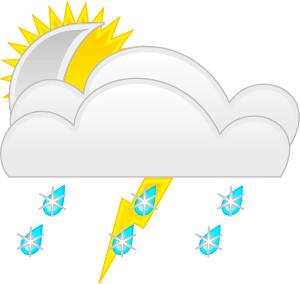 This sums up the weather here in Northern California today. I woke up to rain, thick clouds and the furnace running full blast, and by one o’clock the sun was out and it was warm enough to garden in my t-shirt! I have been investing some major time over the last few months learning Illustrator, Photoshop, and the finer points of designing technical repeats. 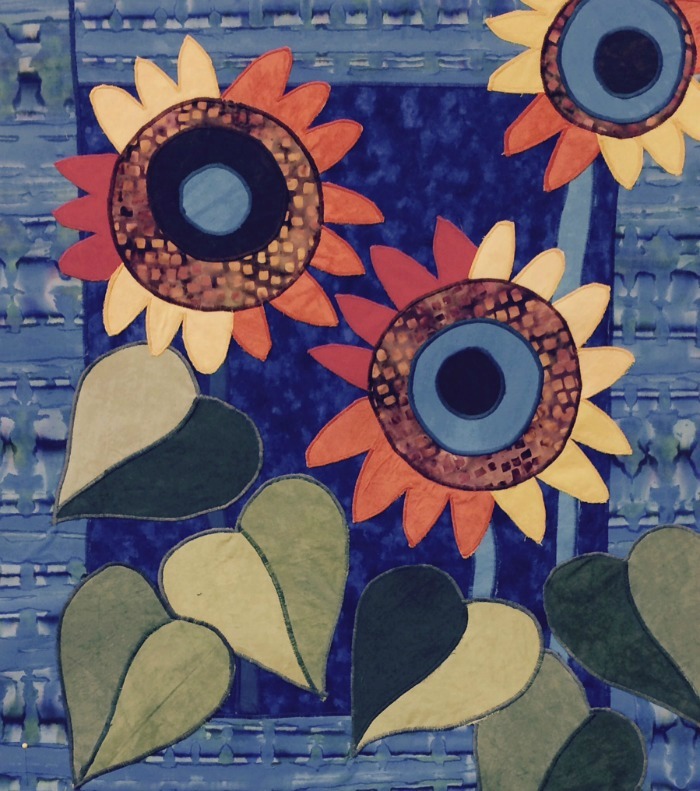 I have always dreamed of designing quilting fabric and that is becoming a reality. With digital printing services like Spoonflower, creating fabric has become almost as easy as having a digital photo printed. My designs are getting a little better with practice. I thought I would share some of my first designs from last Fall, if you promise not to laugh. 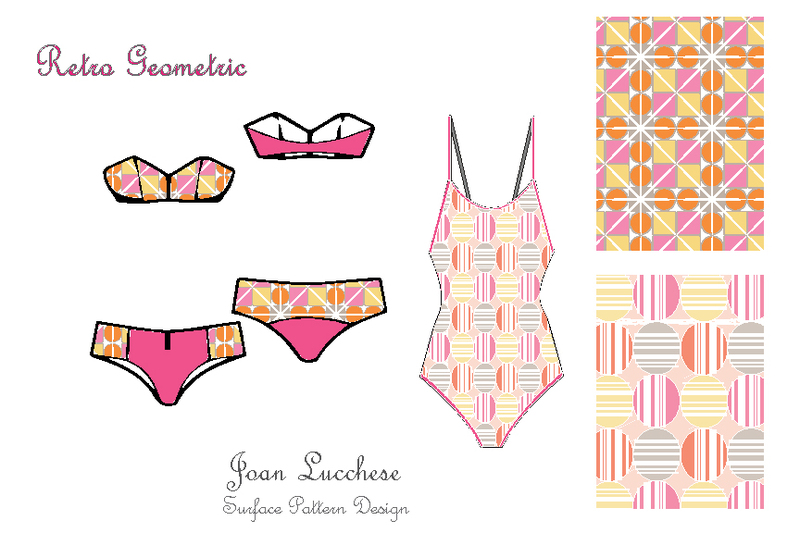 These patterns were in response to an assignment to design a retro geometric fabric for swim wear. 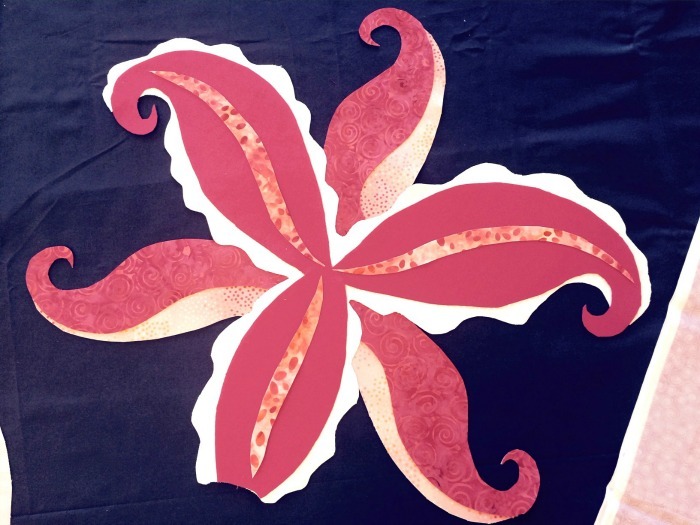 This design was practice using a hand-drawn and hand-painted object and then flipping and turning the object to make a pattern with a layered background. 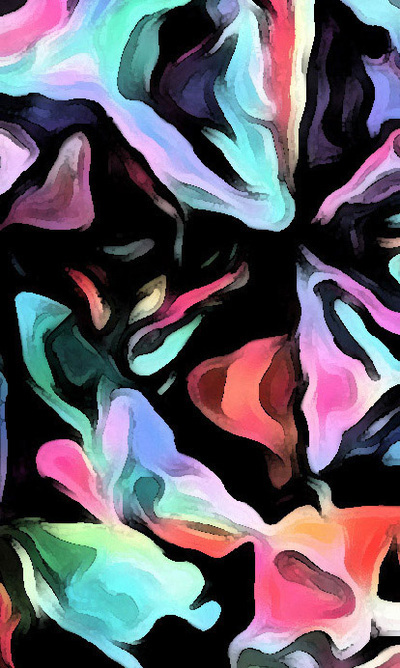 This was practicing with abstracts. I love the colors in this one! It is not in a repeat yet, but when it is, I will have this printed. I can’t believe this week is over. It just flew by. I can highly recommend this workshop. What fun. 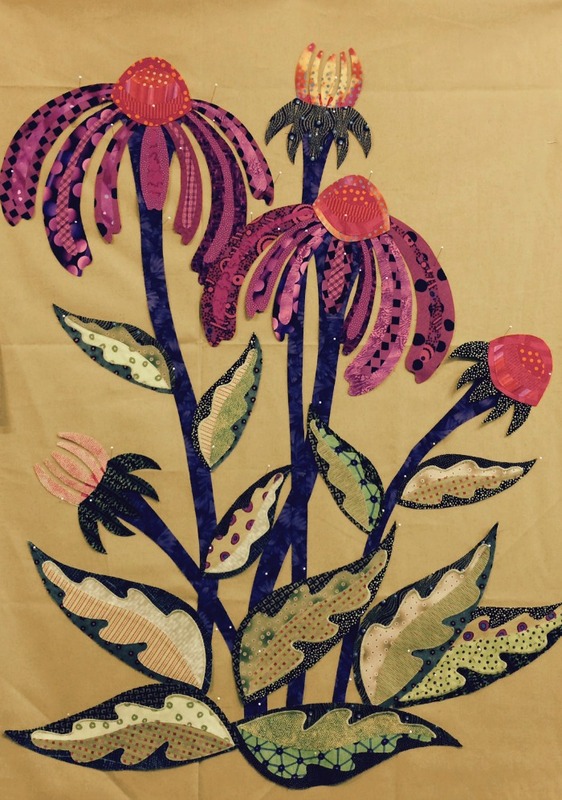 Day four was spent cutting, fusing and sewing our flora. At 3:30 on Thursday afternoon, everything was tidied up, our work was hung on the wall in whatever state it was, and we spent a couple of hours visiting the other classrooms to see what everyone else had been doing during the week. It was astonishing to me how much work was accomplished in this class. With a day and a half spent drawing and practicing abstraction, these pieces were cut and sewn in a little over two days. This is the work completed by our class. The first one is mine, which I am going to use as a study for a much larger quilt. I am excited to get started on it. My photo of these gorgeous succulents does this piece a serious injustice! It is gorgeous. You can see that some amazing work was done this week. I can highly recommend Jane Sassaman as a teacher. She is patient, kind, and not afraid to tell you if something is looking like it is from outer space. Today we packed up, said goodbye and made our way home. Tomorrow I will share some photos taken from the visits to the other classrooms. 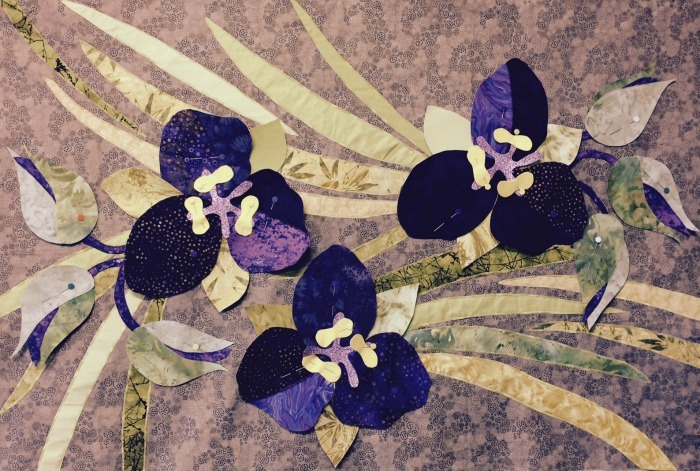 It was another busy day at Art Quilt Tahoe. 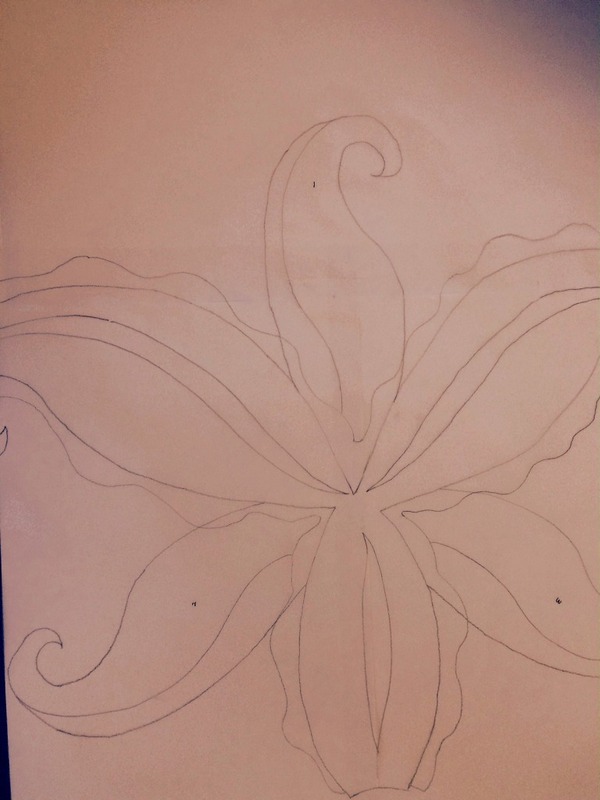 Our assignment for today was to do a number of studies of the flower we intend to abstract. 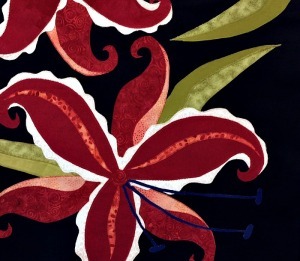 I am doing a Stargazer Lily because it’s one of my favorite flowers and I think it will make an interesting subject. We had to draw the flower from all angles, as well as make it fit into a square, a circle and a triangle. This forced an abstraction of the flower. After that, we abstracted it even more. Once we were finished with that, we chose our favorite view and enlarged it to about 24 inches square. This is my enlarged drawing (sorry, it is pencil on tracing paper and it’s hard to see). 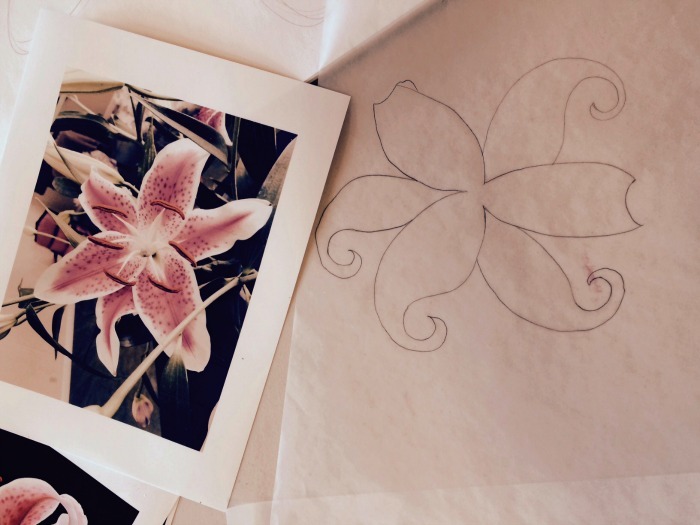 After that, we traced the pattern into parts on to tracing paper and cut out patterns for the various parts of the flower. 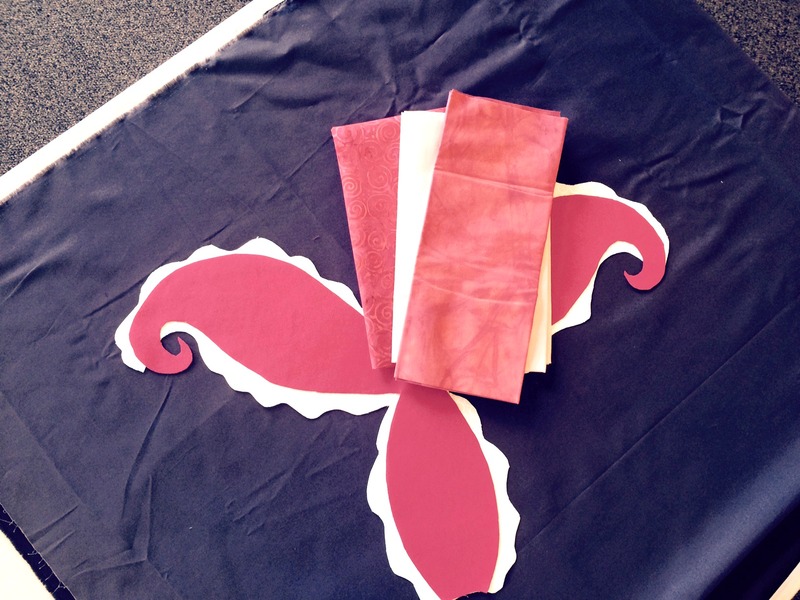 This was followed by trying out a number of fabrics to find the best color and print for each part. 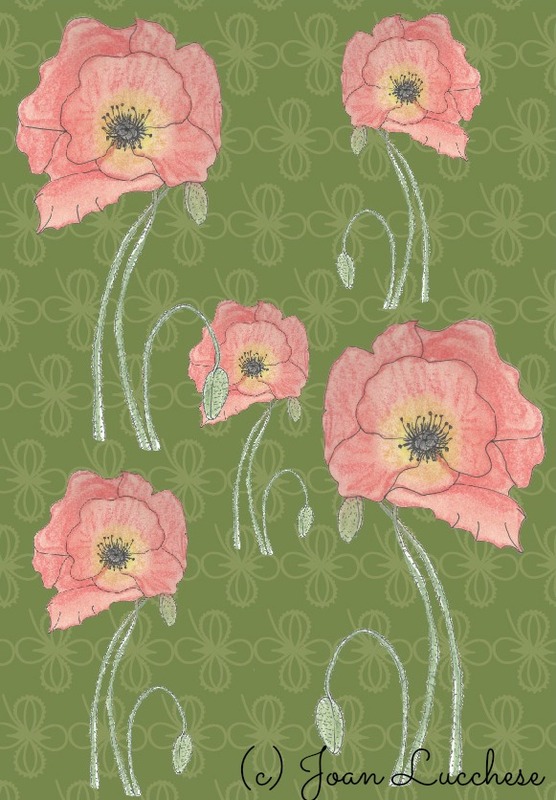 I thought the black background would be dramatic with the pink flower, but it is too harsh and will need to be changed. Tonight, I have to sit down and draw some abstract leaves to put on this in the morning. 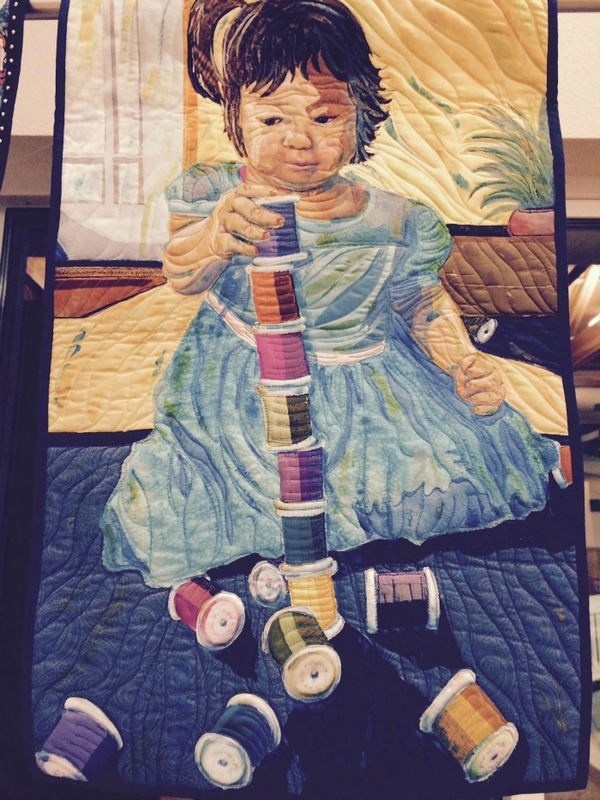 There was no identification on this tiny quilt, depicting a toddler stacking 16 spools of thread.